DO YOU NEED AN EVENING/WEEKEND BABYSITTER OR SOMEONE TO LOOK AFTER YOUR CHILDREN DURING SCHOOL HOLIDAYS? School drop offs or pick ups from Edgebury Primary school, Chislehurst? DO YOU NEED A TUTOR SPECIALISING IN SEN/KS1/EARLY YEARS and phonics? I have two children Boy 7 (and a half!) and a baby girl 4 months (April19). I am a fun and caring person, who is also very organised, yet flexible. I enjoy working with children and strive to bring them the best start in life. I have 19 years experience as a nanny and babysitter around London. I have worked with boys and girls from newborn to teenagers, some with special needs including Down's syndrome, deafness and other complex learning difficulties. I am especially good at coping with children who have differing needs and keeping everyone happy and stimulated at the same time. I enjoy cooking delicious, healthy meals, helping with homework and projects, doing arts and crafts activities, organising playdates and taking children out to the woods, to playgroups, libarary and picnics in the park to name but a few. 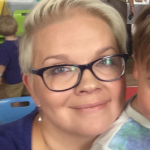 I am currently on maternity leave from working as a teaching assistant in a primary school, working with groups or individual children in KS1, some with special educational needs. I have also done private tutoring, specialising in KS1, early years and special educational needs. I am the chairman and head teacher of Croydon Finnish Saturday School and also teach the 0-3 music class and 3-6 class there. - 19+ years childcare experience. - 6 years experience working as a teaching assistant. - NVQ3 for teaching assistants. And studies towards NVQ3 in early years care and education. - OT training in fine motor skills, pencil skills, sensory circuits etc. - Introduction to EYFS (Early Years Foundation Stage), child protection and other training. BABYSITTING/TUTORING IN THE EVENINGS OR WEEKENDS. Drop offs/pick ups from Edgebury primary school. Please do not hesitate to contact me for an informal chat and more information. Thank you.